Unique automated solution saves 40% testing time on Fiber Optic Network deployment. JDSU 4100-Series FiberComplete family is the first solution to allow performing automatically bi-directional Insertion Loss (IL), bi-directional Optical Return Loss (ORL using OCWR method), distance and Bi-directional OTDR or Fault Finder, using one fiber connection with one button-push operation. This is the only bi-directional loss test set on the market that can characterize splices and connectors, and locate faults. Up to 6 instruments in 1 test module. 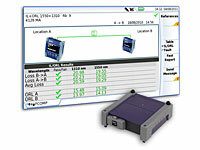 One connection, one-touch automated measurements. Real-time continuity check and product pairing using the fiber under test. Immediate troubleshooting with Fault Finder mode. Workflow optimization with Pass/Fail indications and direct report generation. Installation and commissioning of Access , Middle Mile and Metro networks. Maintenance and troubleshooting of any fiber optic links. FTTH/PON network construction and acceptance testing. Step by step wizard for initial IL/ORL test referencing. Fiber or Cable results management. Compatible with Metro-Access (MA) and Metro-PON (MP) OTDR.